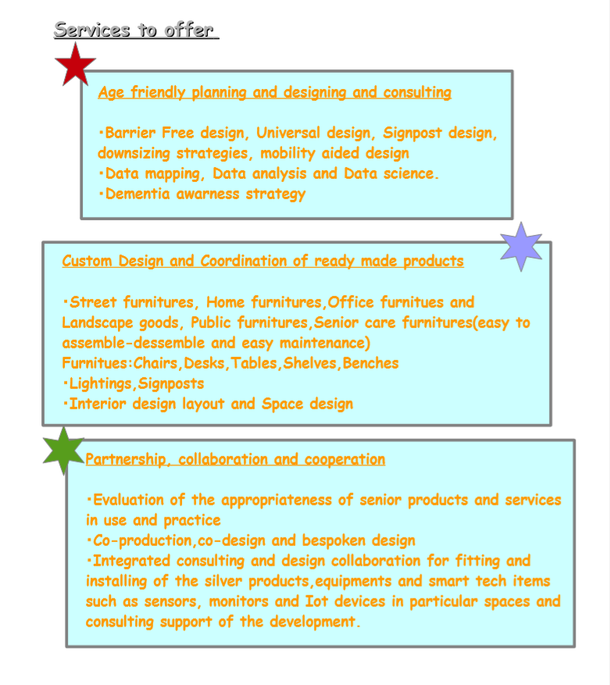 <Age friendly design> & <Universal design>for reshaping the current settings of the space at all scales. ・Data mapping, Data analysis and Data science. Partnership, collaboration and cooperation of development of senior products and services in architecture and real estate sectors. ・Integrated consulting and design collaboration for fitting and installing of the silver products, equipment and smart tech items such as sensors, monitors and Iot devices in particular spaces and consulting support of the development. We have established experiences for buildings of various programmes based on ''barrier free design'' and ''universal design'' for aged and handicapped people fully in accordance with upmost building regulations and related implementation accessibility codes. Thus, we can offer a palette of different kinds of age-friendly solutions which are sector/programme specific at different scales and in different countries, all of which are further validated and supported by case studies of innovative and cutting edge solutions and assiduous support for the whole society to move on with aging as well as life long R&D activities in collaborations with universities, research institutions, governments, associations and the citizens. Nowadays, many countries are blessed with a wave of aging population and a high longevity in the years to come at unprecedented scales, at the same time, face low fertility rates and a reduction of active working generations in the entire economy. This tendency is unstoppable and upward for many decades to come and leads to an enormous impact of demographic change and aging, which weighs on a better quality life, health and welfare and the citizenship, subsequently on the entire society and social cares in general and the economy, cities, regions, buildings, societal system in particular. As such, we are asked for a preparedness and adaptation for aging with varied expectations and subjective feelings and habits. On top of it, the aged population is largely thought of a trigger for dementia, diabetes and any physical impairement for daily activity, not to mention, sad experiences such as loneliness, segregation, invisibility and can not stand the current settings at various scales though it is formed not only by retired seniors but also by active seniors being valuable actors with active roles in the entire society. On the other hand, silver economy, still often defined in the market for seniors will need to address the appropriateness of the products/the goods and services on ageless economy or multigenerational society and universal design and subsequently, coupled with a demographic diversity and handicapped people. All this is not only related to cliches like city dwellers and urbanisation which tend to be highlighted in a wide rage of statistics of the established institutions but also to aged people in the suburbs and the rural areas which require imminent interventions as regards the issue. 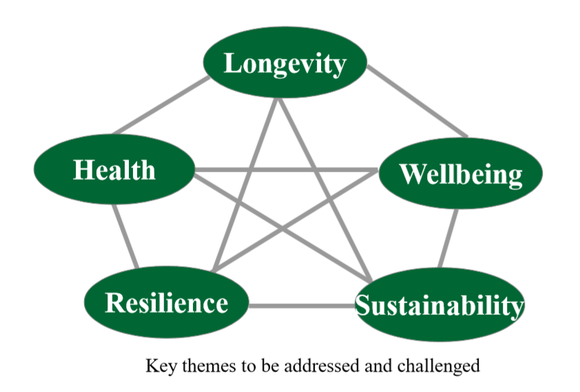 Longevity, Health, Wellbeing, Resilience and Sustainability are key complex themes to be addressed and challenged for the aged population and the silver economy in both age specific and multigenerational manners, even on accounts of future entrants into silver generations, handicapped people and people in diverse social status as the direct or indirect beneficiaries on the idea. As such, we rethink so far standard design repertoires responses to ageing and new appropriateness about intended what-ifs approaches and settings through the active involvement of the participation of stakeholders and actors concerned which results in inclusive design on the perceived ground in different levels relevant to our products and services. Furthermore, vertiginous advancement of the technology and innovative services such as smart technology and automation, robotics, data driven praxis becomes increasingly ingrained in existent and new products and services in many sectors, including care industries, buildings and the infrastructure in different scales, from gadget to, housing, buildings, neighbourhood, community district, cities, towns, and regions etc. AGE FRIENDLY DESIGN and AGE FRIENDLY PRINCIPLE are used as methodology which serves as design interventions and actions to create an appropriate relationship amongst stakeholders and reshape the spaces concerned and finally, expect to deliver pragmatic models and solutions in the form of products and services. ・Creative interventions as urban and regional practitioner as regards the fundamental issues such as mobility and access in the form of barrier free design and universal design. ・Urban, Suburban and Regional development in the legal and regulatory frameworks of the society and coupled with smart city and eco city. ・Rethink of the current settings through auditing and mapping in varied domains and topics which visualize as yet hidden relations of users to spaces or any barriers or obstructions leading to uncomfortable behaviours, even on the ground of subjective feelings of aged people about them. Such domain by domain or subject focus maps are stocked as data base together with census or findings and result in soft or hard informations in different layers. Finally, this intervention generates enormous implications of the spatial relationships in different layers of data as spatial juxtapositions and serves to question, validate so far settings and new ones and otherwise transform them into appropriate ones for the benign epoch. ・Rethink of workplaces, care centres, public spaces for different comfort and height requirements and mobility impairement and cognitive weakness of elderly people, demands of caregivers and diverse range of users towards age friendly work environment and pleasant spaces with impacts on physical health, mental state and productivity. ・Conception of different spatial requirements about lighting, acoustics and ergonomics. ・Involvement of smart technology and bio-medical accounts with health and wellbeing management. ・Broad range of senior living from family home to² care facility to group homes and nursing homes and senior residences etc. ・Rethink of spatial requirements for the above adapting to the impaired mobility and physical strength on health and comfort and social inclusion in the household and community. ・Involvement of smart technology and appliances and in-house care devices for comfort.